The other day I was in court handling a reckless driving charge for a client, and I overheard another lawyer giving his client bad advice. It drives me crazy when folks pay good money to an attorney who tells them flat out false information. If your reckless driving in Virginia case is being dismissed, it will NOT show up on your driving record. Period. It simply won’t be on there. This is why fighting your reckless driving charge is critical. Having it dismissed completely is the only way to keep it off your record. 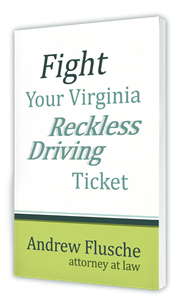 If you are found guilty of reckless driving in Virginia, the conviction will hit your record. DMV will assess 6 points, and the conviction will stay on the record for 11 years. Hire an attorney who knows what they’re doing. Don’t hire someone who dabbles in traffic cases.